Extreme environments typically require costly adaptations for survival, an attribute that often translates to an elevated influence of habitat conditions on biotic communities. Microbes, primarily bacteria, are successful colonizers of extreme environments worldwide, yet in many instances, the interplay between harsh conditions, dispersal, and microbial biogeography remains unclear. This lack of clarity is particularly true for habitats where extreme temperature is not the overarching stressor, highlighting a need for studies that focus on the role other primary stressors (e.g., toxicants) play in shaping biogeographic patterns. In this study, we leveraged a naturally paired stream system in southern Mexico to explore how elevated hydrogen sulfide (H2S) influences microbial diversity. We sequenced a portion of the 16S rRNA gene using bacterial primers for water sampled from three geographically proximate pairings of streams with high (> 20 μM) or low (~ 0 μM) H2S concentrations. After exploring bacterial diversity within and among sites, we compared our results to a previous study of macroinvertebrates and fish for the same sites. By spanning multiple organismal groups, we were able to illuminate how H2S may differentially affect biodiversity. 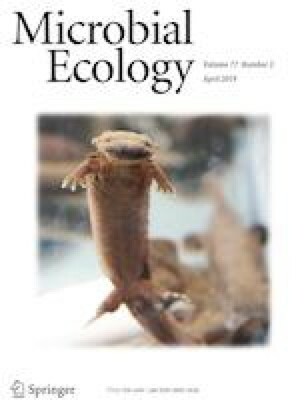 The presence of elevated H2S had no effect on overall bacterial diversity (p = 0.21), a large effect on community composition (25.8% of variation explained, p < 0.0001), and variable influence depending upon the group—whether fish, macroinvertebrates, or bacteria—being considered. For bacterial diversity, we recovered nine abundant operational taxonomic units (OTUs) that comprised a core H2S-rich stream microbiome in the region. Many H2S-associated OTUs were members of the Epsilonproteobacteria and Gammaproteobacteria, which both have been implicated in endosymbiotic relationships between sulfur-oxidizing bacteria and eukaryotes, suggesting the potential for symbioses that remain to be discovered in these habitats. The online version of this article ( https://doi.org/10.1007/s00248-018-1237-6) contains supplementary material, which is available to authorized users. The authors thank Omar Cornejo for the use of his laboratory space and input, Caren Goldberg for microbial sampling advice, Lisa Orfe for sequencing assistance, Joe Giersch for help producing the sampling map, Lydia Zeglin for statistical input, Anthony Brown and Ryan Greenway for assistance in the field, members of the Kelley and Cornejo labs for manuscript comments, and two anonymous reviewers for their input on the manuscript. Research was supported by grants from the National Science Foundation (IOS-1557860 to M.T. ; IOS-1557795 to J.L.K. ), US Army Research Office (W911NF-15-1-0175 to M.T. and J.L.K. ), NIH COBRE Phase III (P30GM103324), and the Explorers Club Youth Activity Fund Grant to J.B.P.